This is a crochet hand woven Cuenca hat. Made of the same type of straw of the famous "Panama hats" (Paja Toquilla). These hats are woven with different coloration's of dyed straw that gives the hat a nice and colorful touch. Very durable straw very resistant to rolling or crushing for the kind of crochet stitch pattern this hat uses 4 times more straw then any other panama hat! They can be worn with or without any exterior hat band. Great quality and durability and they are ideal for wearing at the beach or any outdoor activities. 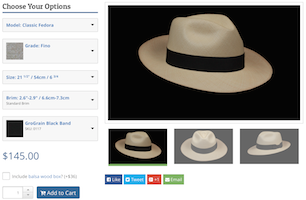 Send us your question about this Cuenca Grade 4 Pava hat, and we will respond to you as soon as possible.